How to Change iCloud Name? Maybe at some point, you have thought of changing your iCloud name. However, you haven't changed the iCloud name because you don't know how to do it. How to change iCloud name is not as complicated as you might think. This article will teach you how to do it. But before start, we think you should figure out what you wanna change, in consideration of the complexity of iCloud. Are You Sure What You Wanna Change? How to Change iCloud Username on Your iPhone? How to Change iCloud Username on Mac? How to Change the Name Displayed on Emails Sent from iCloud? Before Changing iCloud Name, What Should You Do? 1. Are You Sure What You Wanna Change? When you talk about "change iCloud name", it may mean different things - the username displayed in your iCloud account on your device, or the name displayed on emails sent from iCloud. 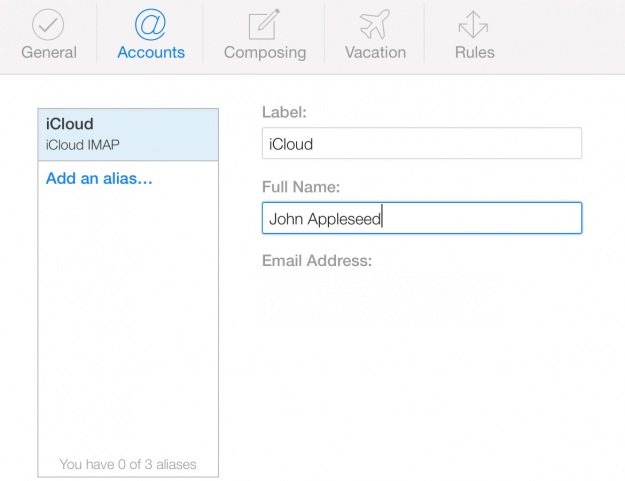 We will show you how to change names in different iCloud settings in this article. 2. 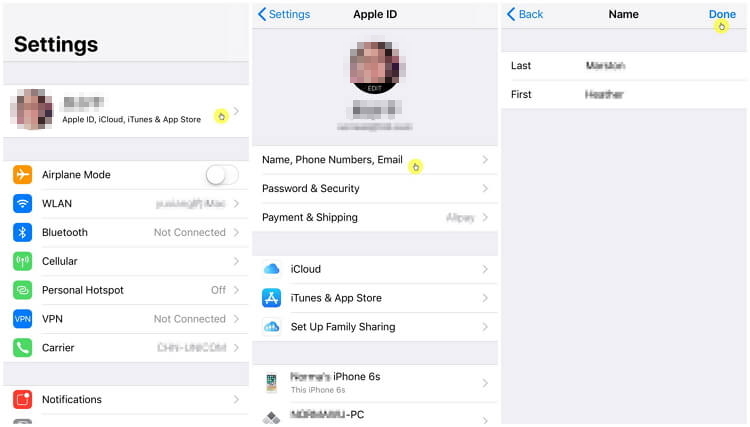 How to Change iCloud Username on Your iPhone? Step 1: Visit your device Settings. Tap your current name which is under Settings if you use iOS 10.2 and later version. For iOS versions before 10.2, just tap iCloud. Step 2: Tap Name, Phone Numbers, Email and then tap your name at the top. Step 3: Replace your first and last names with the ones you prefer. Step 4: Tap Done on the top-right corner to save changes. You can also edit your profile picture by tapping the Edit option under the profile picture. 3. How to Change iCloud Username on Mac? Step 1: Select Apple Menu and then System Preferences. Step 2: Click iCloud and then Account Details. Step 3: Click on General and then enter your first and last name. 4. Change the Name Displayed on Emails Sent from iCloud? Step 1: Visit iCloud.com and log in using an Apple ID and password you own. Step 2: Visit the Mail app. Step 3: On the bottom left corner, you should see a small gear icon after the Mail app opens. Click on it and then choose Preferences. Step 4: Click on the Accounts tab. Step 5: Change the current name to the new name that you prefer. Step 6: Click Done to save the changes. 5. Before Changing iCloud Name, What Should You Do? Before making any changes to your iCloud username and the name displayed in emails sent from iCloud, it is important that you back up your device since data can get lost during the process. Backing up your device on iCloud is not a smart choice since changing your iCloud username can affect iCloud data. A better way to back up your data is to use a free iCloud alternative, and the best one we recommend is iMyFone D-Port. What Is iMyFone D-Port and Why We Choose It? It is much faster than iCloud backup. 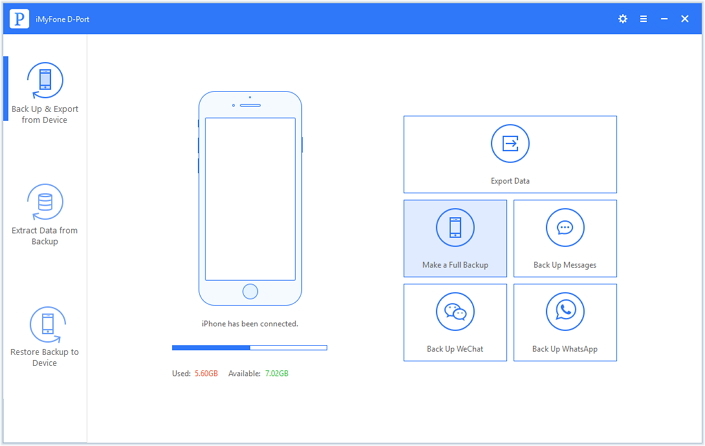 The new backups made by iMyFone D-Port do not overwrite the old backups. It doesn’t use your iCloud space, you know that iCloud only offers 5GB free space and it is even not enough for the only partial data on device. It has more functions than iCloud - you can back up your iPhone data selectively. It is completely FREE to back up data on your iOS device. How to Back Up iPhone Before Changing iCloud Name? Step 1: Run iMyFone D-Port on your PC or Mac and connect your iPhone to the computer. Step 2: On the left panel, select Back Up & Export from Device and then click Make a Full Backup. Step 3: Click the Back Up Button. iMyFone D-Port will start the backup process. Keep your device connected until the backup is complete. Changing your iCloud name is easy. This article will help you change both your iCloud username on your device and the name appearing in your iCloud emails. 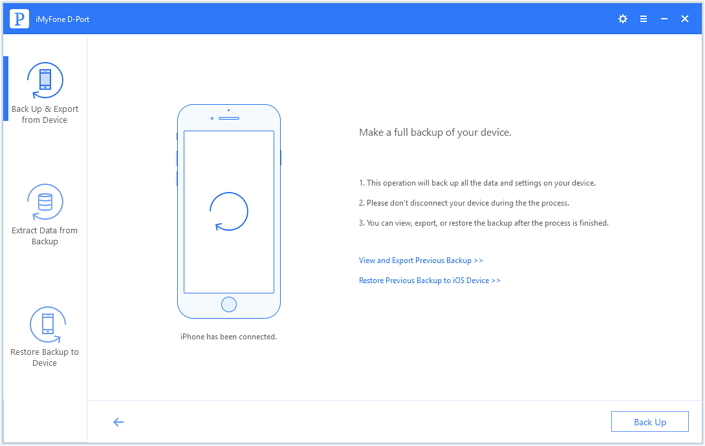 However, make sure that you back up your data before changing your iCloud names so that you can restore the data in case it gets lost in the process. Use iMyFone D-Port for backup since iCloud data is still vulnerable to the changes you make to the iCloud name.